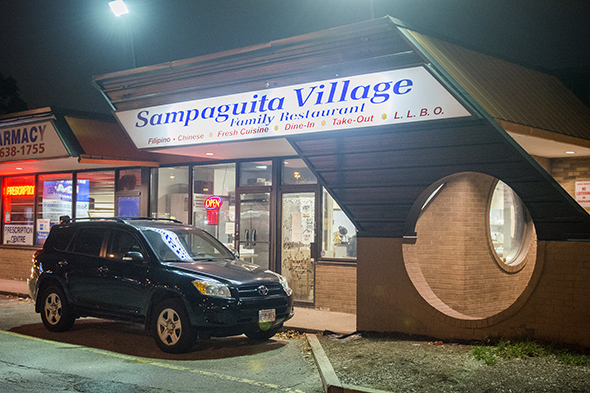 Sampaguita Village serves up classic Filipino favourites in Little Manila. 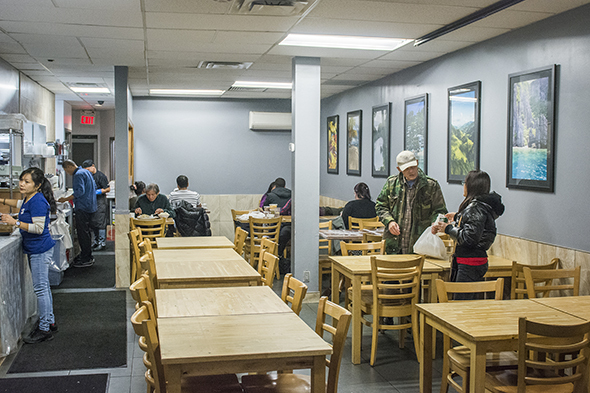 The building's drab exterior may not win points for aesthetics, but those craving authentic Filipino comfort food have been frequenting this place for years. There's a lot of hustle and bustle here - you can easily find owner Sam and his daughter Berlinie, cheerfully conversing with patrons during mealtimes. 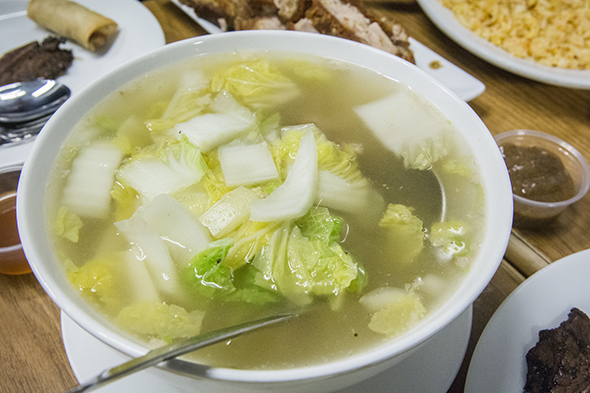 The Sinigang Vegetables ($3.75 - medium portion) is a good dish to start with. It's a clear vegetable soup with a pronounced tomato flavour that gives it a nice tartness. Or go for the Lumpia de Shanghai ($4.95). 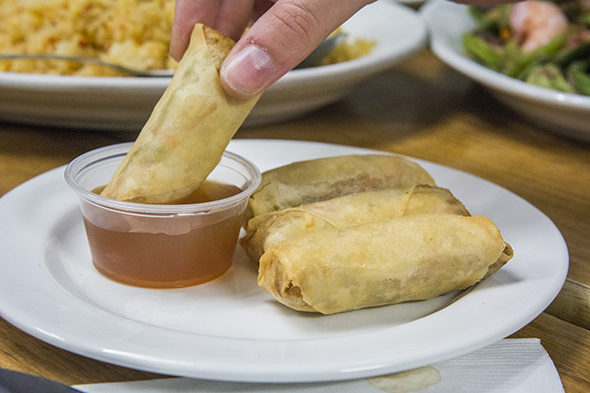 It's a plate of golden-coloured fried spring rolls, made from scratch in-house, with a side of sweet dipping sauce. 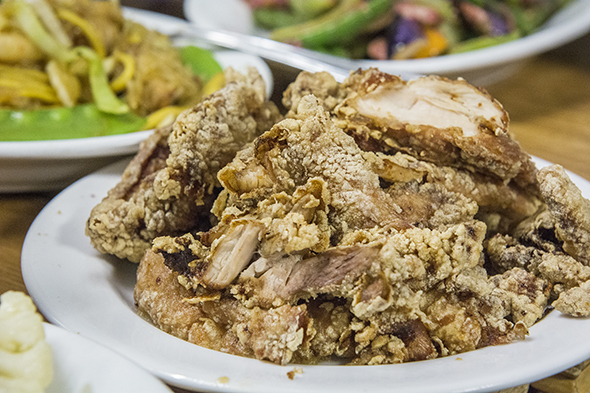 Sampaguita Village has two house specialties - the first is the Crispy Chicken ($6.95 - medium portion). It's super tender with a thin crisp skin, I just wish there was some sort of spicy mayo to go with it, but the dish it so delicious it can stand on its own. 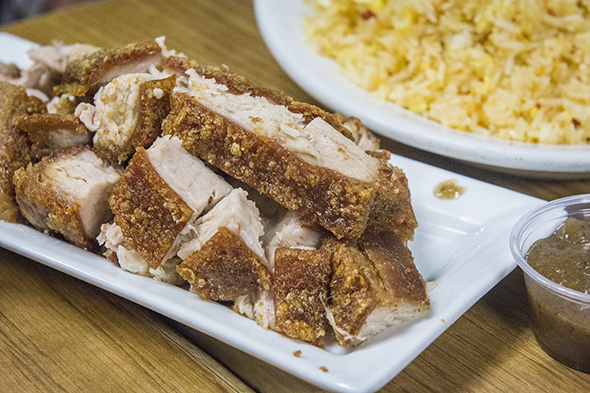 The second absolute must-order item here is the Lechon Kawali ($14.95). The fattiness of the pork belly and the perfect crispness of the skin make this one of the best renditions of the dish I've ever tried. Limited quantities are available each day, so make sure you come before they sell out. 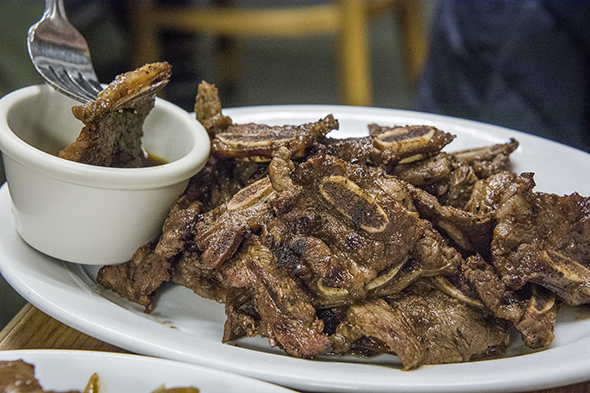 The Korean Beef BBQ Short Rib ($14.95) is less sweet than the more conventional versions. While still satisfying, I personally prefer the more authentic Korean version, though my dining companions vehemently disagree with me. If you get a case of meat overload, break up the carnivorous carnage with some Mixed Vegetables ($8.25) where you get a simple stir-fry of greens ranging from cauliflower to broccoli. Nothing fancy. You can also try the Bulalo Soup ($11.95), a subtly-flavoured oxtail soup broth that's mixed with generous helpings of assorted vegetables. 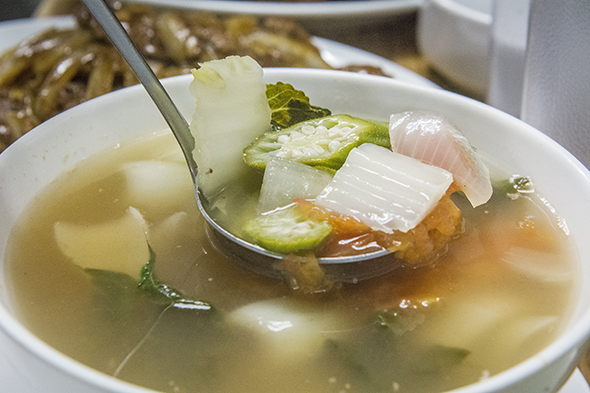 Perfect for clearing those cold-day sinuses. 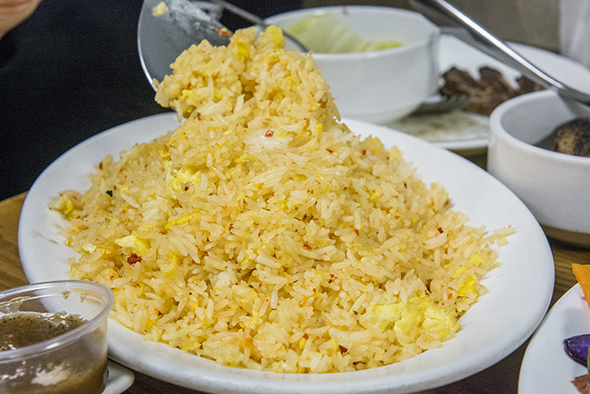 And if you're looking for some carbs to go with all this protein, go for the spicy Garlic Fried Rice ($7.50 for the basic version, +$2 to add egg, +$2 to make it spicy). The strong garlic smell that emanates as the dish is put in front of me is pure aphrodisiac. 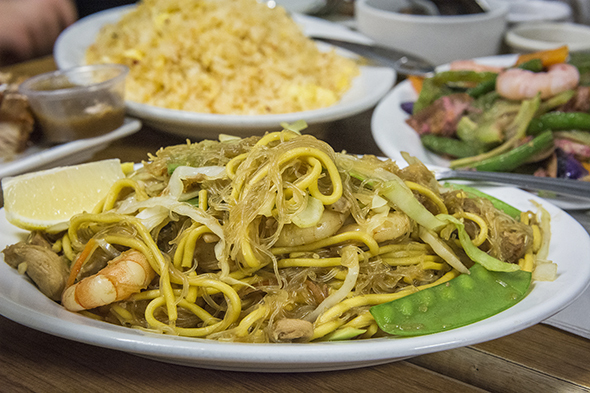 And those looking for a noodle staple won't go wrong with the Pancit Sampaguita ($8.35 - medium portion), a delicious combination of egg noodles and rice noodles, mixed with kawali, chicken, and shrimp. 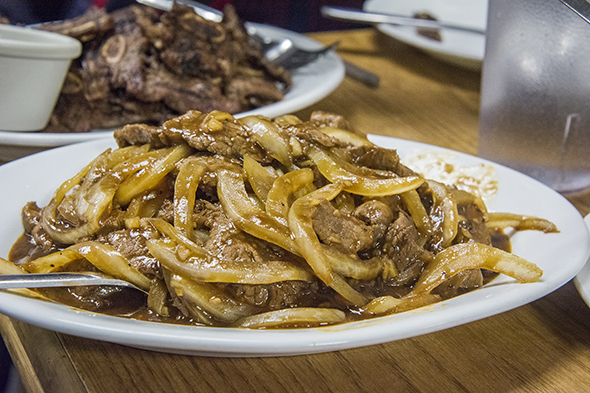 If you're still craving more meat, the Filipino Beef Steak ($13.55) is a good option. Beef flank pieces with no tenderizers and additives are lovingly mixed with a thick pepper sauce that goes fantastic with any rice dish. 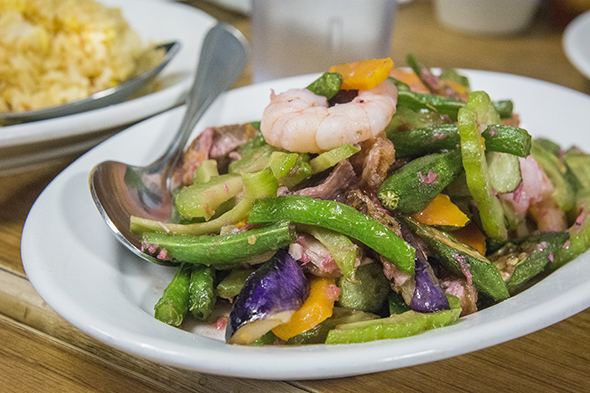 Finally, the Pinakbet ($10.95) is a concoction of super succulent shrimp, pork, and assorted vegetables like bittermelon sautĂŠed in bagoong, the famous Filipino version of shrimp paste. 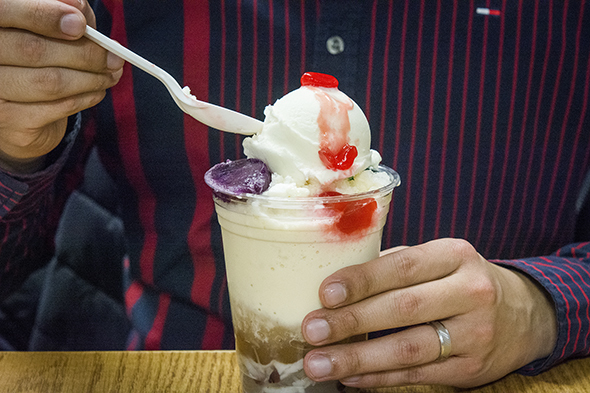 Don't forget to close the meal with a Halo-Halo ($6.95). Sampaguita Village's version of this popular Filipino dessert is a bit less sweet than other ones I've tried, but I still enjoyed it thoroughly. Kind of wished it came on a bigger bowl for easier mixing though. 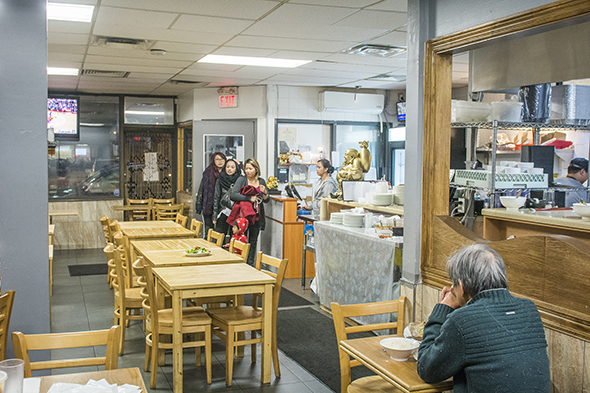 Though not fancy, the restaurant exudes a warm and convivial atmosphere. The space may be small, but the smiles and laughters are certainly super-sized here.